Over the past twenty years of working with wood, I have applied many finishes such as soap, shellac, oil, varnish, lacquer, polyester and polyurethane, and urishi. I have poured finishes, mopped them, sprayed, brushed, burnt, rubbed, and polished. I have even experimented with not finishing wood just to see what all the fuss is about. 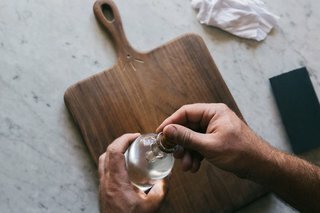 At the very least, it is safe to say that there are many different preferences, techniques, traditions, and recipes out there, from the most basic to the very complicated. 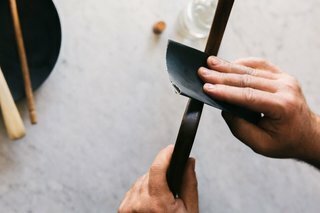 Instead of just suggesting a recipe (which, in the hands of two different "chefs," may result in two very different "dishes"), I wanted to share some guiding concepts about oil finishing woodenware—feel free to skip ahead to what interests you about it most! 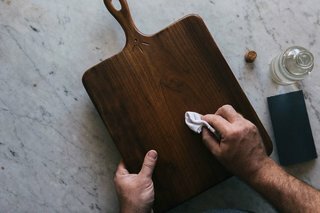 Why Finish Wooden Kitchen Tools & Cutting Boards? 1. 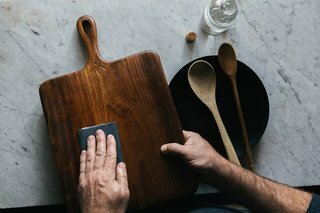 Why finish wooden kitchen tools and cutting boards? Not all wood need be "finished" to be used—but if it requires regular cleaning or comes into close "people" contact, wood greatly benefits from the addition and maintenance of a finish. Wood is, after all, inherently resilient and can last a lifetime or more if properly maintained, gaining both familiarity and grace as it ages. 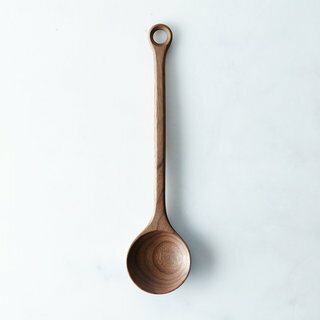 Specifically, wood in the kitchen is wood at work: Here it is subject to far greater use and more extreme cycles of expansion and contraction that happen with washing, and it's also often in direct contact with the very food that we eat. It's important, therefore, to use discretion in choosing a finish for wooden kitchen items. There are many different types of wood finishes, but not all of them are suitable for the demands of kitchen items. Varathanes, urethanes, and polyesters are out of the question, in my personal opinion—why would you want to cover a beautiful piece of wood in a layer of plastic, and then eat the plastic when it begins to wear off or you cut through it? Oil finishes, on the other hand, are great for wood that will be used in the kitchen and needs to stand up to heavy use. Oil will penetrate into the fibers of the wood, where it helps resist absorption—but is also semi-permeable, meaning that it will allow the wood to breathe (much better for the longevity of the wood and the finish as well). It's easy to apply, easy to maintain, and the resulting healthy-looking sheen will only get better looking with age and use. 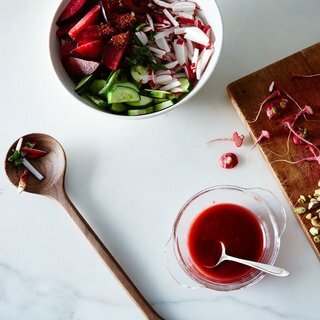 What's even better about oil is that there are several entirely nontoxic, food-safe options to choose from. 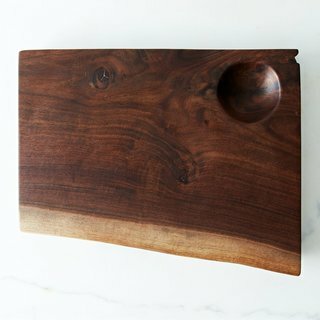 Oiling wooden kitchenwares is ultimately about cleanliness.A good cutting board finish should not be thought of as a "bulletproof" coating that renders the surface impregnable, but more like a flexible, workable layer that allows you to scrub it regularly using soap and hot water. This step—keeping things clean—is at the beginning and end of any board finishing process, the basics of which are very simple, with results that are immediately recognizable. 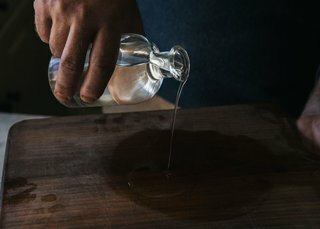 Oil keeps wood moisturized.Dry wood, not unlike a sponge, is absorbent by nature (think of how a tree moves water and nutrients up from the soil and into branches and leaves, up through the trunk). Wood's purpose in this state is to be saturated with water, seasonally expanding and contracting; it only begins to dry out when the tree dies, or when we start to turn that wood into lumber. Keeping the surface fibers saturated with oil helps to control wood's natural fluctuation in moisture content, minimizing the likelihood of splitting and cracking while also helping the wood become more resistant to absorption. Most oils need to be re-applied over time to be fully protective and conditioning. Not all oils are created alike. 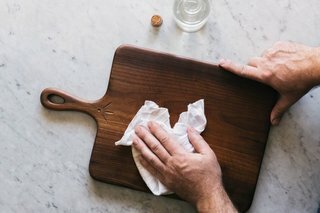 Many natural oils, like olive oil and corn oils, can turn rancid after prolonged exposure to air—they're said to "sour" wood utensils and should be avoided. But there are a number of better natural options. 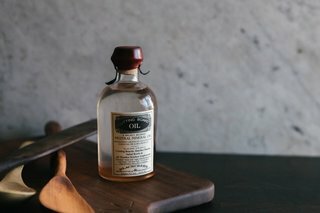 At Blackcreek Mercantile, we sell a cutting board oil blend that's specifically formulated to work well on kitchen tools, but here are a few other standard oils to choose from, along with the up- and downsides of each. They're most always yellow or amber in cast, a color that is then imparted to the wood that they are used on, and they characteristically oxidize and darken with age and exposure to sunlight. 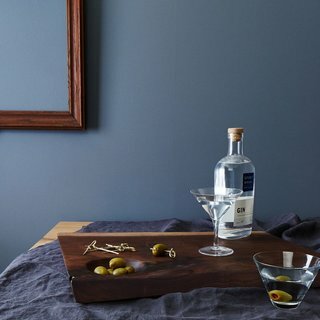 Several coats are necessary to build up enough finish to make a suitably resistant surface—though on the flip side, they're relatively inexpensive, widely available, and re-coating with them becomes progressively easier as the finish begins to build. Even though they're natural products, people with nut allergies may have an adverse allergic reaction to the oils or wood that has been treated with them, so use discretion. Another popular board finish, mineral oil is a 100% neutral petroleum by-product. Highly refined mineral oil is food-safe, used extensively throughout the food industry for anything from machinery lubrication to a baking pan release, and it has an unlimited shelf life (!). While it imparts the same protective and resistant qualities of other oil finishes, mineral oil differs in that it never really dries and it does require maintenance (meaning re-application over time). It's absolutely clear, colorless, and odorless, with a softness (rather than greasiness) to the finish. 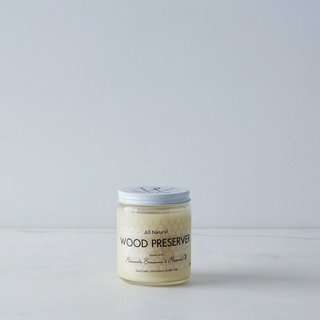 Another popular and food-safe finishing option, salves or "butters" are usually a combination of oils and waxes blended to make application of the wax easier. Wax is a tenacious substance; it also never fully dries and is capable of both covering and resisting most everything. Wax can even be applied over an oil finish, but I observe the rule that once you use wax, there is no going backwards—it's incredibly difficult to remove completely once applied. As a top coat or end treatment, wax is unparalleled as a wood finish, but as a finish in the kitchen, it needs regular maintenance. All board surfaces need to be prepped when they're dry, no matter what kind of finish you're applying. 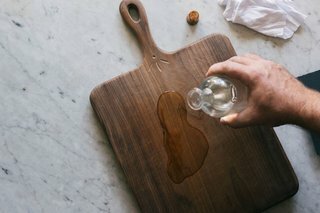 Rough, fibrous surfaces—such as your most beloved cutting boards—are difficult to finish, so it's best to address this before oiling. Sanding is an easy, inexpensive way to smooth the surface of wood by removing any scratches with progressively finer scratches. It's important to sand with the grain of the wood, because cross grain scratches are more likely to be visible. Sandpapers are manufactured in grits of graduating coarseness (coarse, medium, fine, and extra-fine)—the lower the number, the coarser the grit. Higher grit papers are available in "wet/dry" or "water-proof" versions, which are usually black and perfect for wet-sanding oil finishes. 35-100 grits are heavy papers reserved for shaping. 150-320 grits are for surface preparation. 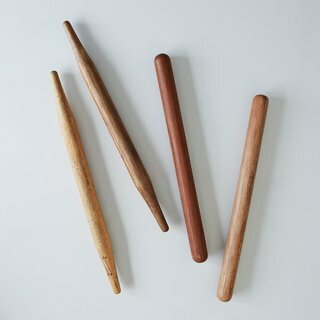 400 grit and higher are especially for refining the finish. 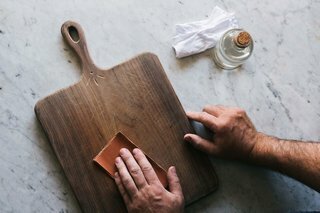 With cutting board finishing, your goal in surface preparation might not be to completely remove cut marks. 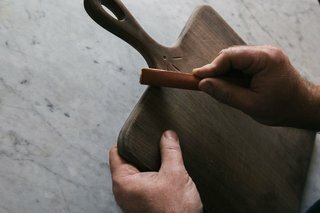 Cutting boards are supposed to be cut upon! Often simply re-coating the board with a fresh coat of oil is all that will be necessary. With all oil finishes, the easiest method of application is to begin by flooding the surface, meaning you'll pour a small amount of oil directly on one side. Then—using a clean, lint free, rag—wipe the oil over the entire surface, propping the board up in the sink to let it soak in (don't lay the board flat or place it anywhere that the oil will be a problem). "Flooding" the board with oil. After the whole board is "wet" with oil, wet sanding may be done to further smooth troublesome grain or rough spots: Using a polymerizing oil, buff the surface clean within 15-20 minutes. The surface should feel dry in the end; let that set overnight. 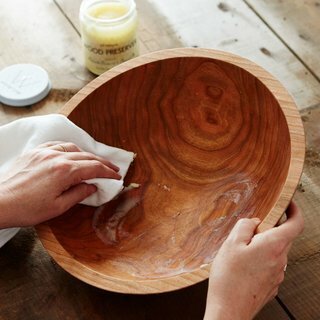 Mineral oil can be left to soak in for hours, even overnight, at which point it should be buffed with a clean rag. For raw wood, plan at least three to five successive coats of a polymerizing oil over as many days, or just two to three coats of mineral oil. "Wet-sanding" for especially ornery grains and rough spots. Sand rough spots on a dry board with 220 grit sand paper—if necessary. Clean the surface with soap and hot water and allow to completely dry. Flood entire board with suitable oil. Smooth with a 400-grit wet/dry sand paper—if necessary—and allow to soak in. Wipe away excess, buff with a clean cloth. Repeat when board shows signs of drying out. In a pinch, refer to this old woodworking adage: A good oil finish is produced by successive coats. After the first coat, one coat every four days after, then one coat after four weeks, then one coat after four months then every four years after. If you feel overwhelmed, just remember that wood is a natural, living material. If it feels like you're working too hard, you probably are. Be patient, let the oil soak in. And remember that a little bit goes a long way. Joshua Vogel is a sculptor, artist, and the author of The Artful Wooden Spoon.